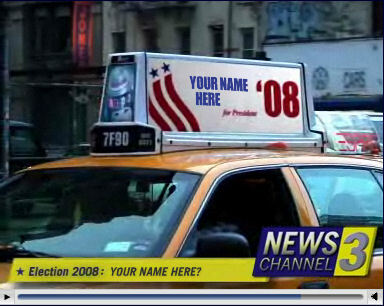 Imagine your friend's surprise when they watch the Channel 3 news report and see YOUR name or even THEIR own name on the billboard, the taxi cab, the bumper sticker, and tattooed on the lady's back! 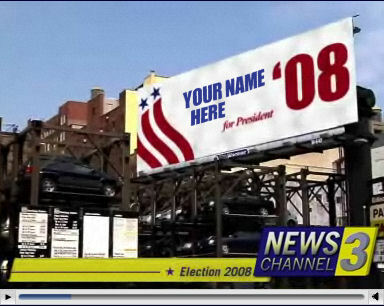 Yes, you can send other people a version of this video with YOUR name or THEIR name inserted as the Presidential nominee. We'll automatically create a link and a sample e-mail you can send to your friends. Or make a special video for each person. Click here to bookmark this page as a FAVORITE. You can then come back here as many times as you want, and create a personalized video link for each of your friends. What a surprise it will be for each of them to watch the video and see their own name show up in the news report!